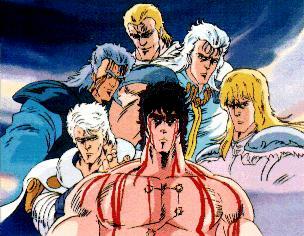 A post-apocalyptic wasteland may well be the perfect battleground for one of the most intense and most brutal action titles in anime: Fist of the North Star, the story of grand fighters and the quest for survival in a world thrown out of balance. Ken is an enlightened warrior. He has been given the moniker "Fist of the North Star." He hands are capable of killing in one punch or healing the sick. Seeking his love Julia, who was taken from him by Shin, the Fist of the South Star, Ken wanders the wastelands, fighting those who would prey on the weak and sowing the seeds of hope for those who will accept. Even as his own mission drives him onward, destiny will bring him new friends and old enemies. Even in this very brutal and graphic title, there is hope, hope for a future.